In its nearly 400-year history, Harvard University has weathered dramatic changes. But if the predictions of climate scientists prove true, the weather itself may pose some of the biggest challenges in the near future. Rising sea levels, warming temperatures, and the increasing prevalence of extreme storms, all anticipated consequences of climate change, could damage campus infrastructure and cause major disruptions for the 40,000 faculty, staff, and students who live and work at the University. Students in the John A. Paulson School of Engineering and Applied Sciences recently worked with the university’s Office for Sustainability to evaluate climate change resilience strategies as part of the course “Engineering Problem Solving and Design Project” (ES 96). They targeted three areas: enhancing the integrity of the electrical grid, cooling buildings during extreme heat, and minimizing damage from flooding. 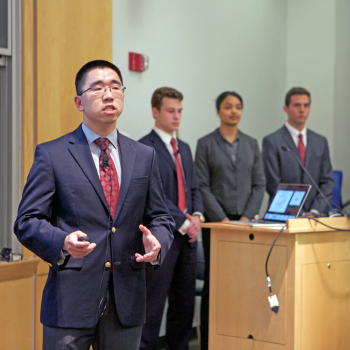 To minimize the threat of power outages, the students proposed implementing “smart grid” solutions. One such solution, distributed generation, increases system redundancy by seamlessly switching between different power sources (both renewable and non-renewable). They also explored the benefits of demand response systems, which restrict non-critical electricity use during periods of peak demand, and self-healing, which automates failure response by rerouting electricity if a power line fails. This graph shows how the prevalence of heat waves is expected to increase. If sweltering temperatures cause a peak demand outage, these three “smart grid” solutions would work together to conserve about 50 megawatts of power while damage is repaired, said Greg Hewett, S.B. ’17, an electrical engineering and computer science concentrator. While the benefits may be clear, estimating the cost of grid improvements is a murkier issue, since the University does not completely control the infrastructure, Stevenson explained. Even as students explained how to minimize the potential for power failure during a heat wave, they cautioned that cranking up the air conditioning is not a sustainable or resilient solution. To help reduce cooling demand, they proposed enhancing existing buildings by adding green roofs or window glazing. For new construction, the students suggested several novel design elements, including thermal energy storage systems. These systems chill water at night, and then use that thermal mass to help cool buildings during the day, said Mounir Jamal, S.B. ’17, a bioengineering concentrator. This diagram shows how a thermal energy storage system operates. New buildings could also incorporate elements of night cooling design, a solution inspired by the circulatory system of a termite mound. Vents in the lower part of buildings let in cool night air, while a vent at the top expels warm air during the day. Implementing a night cooling system could result in a 25 to 35 percent reduction in cooling costs, Jamal explained. As climate change causes more severe rainstorms, additional challenges arise. If heavy rains were to cause a breach of the Charles River Dam, more than eight feet of water could rush into Harvard’s Allston campus. To minimize the effects of flooding on new buildings that may be built in Allston, the students suggested designing structures with “sacrificial” first floors. By creating non-essential spaces on the ground floors, less expensive damage would occur during a flood. These non-critical areas might serve as communal spaces—an exercise room or student lounge—that could foster a stronger sense of community among students, explained Evan Gastman, A.B. ’17, a computer science concentrator. This image shows the potential impacts of a hurricane on Harvard's Allston campus. “You can’t fight the water. It’s easy to say we want to prevent the water from getting in, but with the levels of flooding that are possible, it’s really difficult to keep water out entirely,” said Franklin Li, S.B. ’17, a mechanical engineering concentrator. Instructor Robert Howe, Abbott and James Lawrence Professor of Engineering, was impressed by how the class rose to the challenge of ES 96, which requires students to take on a multi-faceted problem that has many possible answers, none of which are in the back of a textbook. The project, which used the entire campus to provide students with experiential learning opportunities, showcased the multi-faceted dimensions of sustainability, and also emphasized the importance of generating solutions across disciplines, said Heather Henriksen, director of the Office for Sustainability.